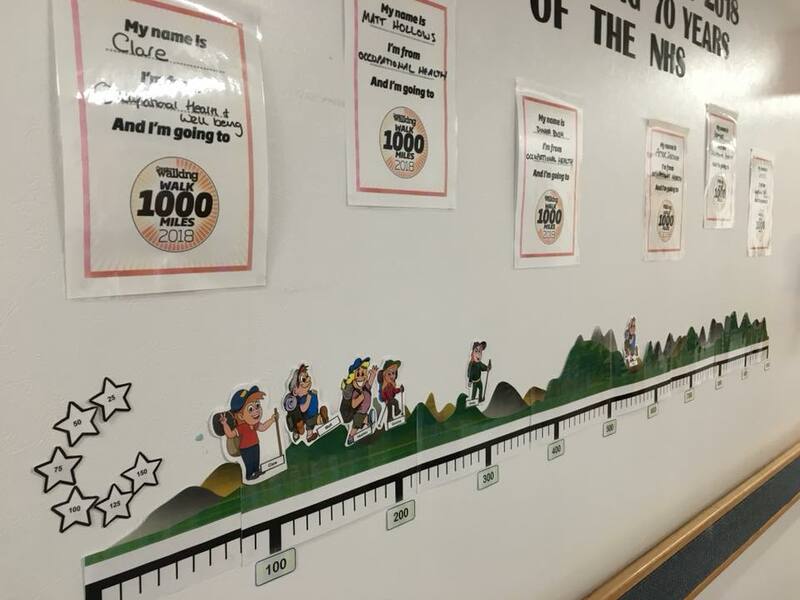 Check out the Occupational Health team at the Royal Lancaster Infirmary’s amazing #walk1000miles chart! Peter and his colleagues' progress chart fills a whole wall! Best of rivals: the Occupational Health team from Royal Lancaster Infirmary Gemma, Clare, Pete, Matt, Donna and Heather. 46-year-old #walk1000miles 2017 veteran Peter Sariwee thought getting his colleagues involved in the challenge this year would be a brilliant way to celebrate 70 years of the NHS. And the chart they created to record their progress is off the scale! Designed by Pete and senior nurse Heather, the pair printed it out in 'tiles' from the computer, laminated each sheet and painstakingly blu-tacked it to their office wall. “Our Administration Manager Scott designed the hills and added the final touches which really look amazing. Our cartoon characters, who we move along the chart each week, finish it off nicely” says Pete. “It’s a great motivational idea and we’ve had some great comments from visiting staff members” he goes on. “We're all enthusiastic about the 1000 mile challenge as we all love the outdoors, walking and it’s a great health and wellbeing promotion. "I just think there’s no more brilliant a way to celebrate such an amazing health service than by walking 1000 miles." • If you've got an in-office competition or shared chart going on we'd love to see it in the Facebook group! • Want to print your own Pledge form and go public with your challenge?.